MAXIMA Heavy Duty Platform Lift adopts unique hydraulic vertical lifting system and advanced high-precision balancing control device, to ensure perfect synchronization of the hydraulic cylinders and ultimately ensure the smooth up and down of lifts. 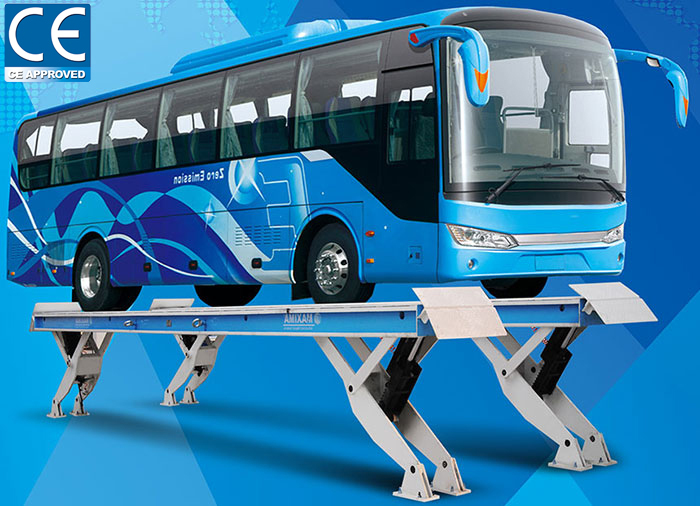 MAXIMA Heavy Duty Platform Lift is designed for the assembly, repair, maintenance, oil-change, washing and other services of various commercial vehicles, such as urban public traffic vehicles, passenger coaches and heavy duty trucks etc. It ensures smooth up and down of the lift even when the two lifting platforms are unevenly loaded. Two lifting platforms function as the carrying agency and each lifting platform is equipped with two cylinders, one at each end. The lift also includes an independent electrical control system, a hydraulic power unit as well as an emergency descent device in case of power failure. The Y-type lifting arm greatly enhances bearing rigidity of the platform and simplifies overall structure of the lift. Furthermore, the Y-type spares more repair space under the platform, thus ensuring free passage of servicing equipments underneath. The electronic and hydraulic control systems share one movable control box, which greatly compacts structural allocation and facilitates daily operation. The lift itself is easy to assemble and disassemble, and can be re-installed easily during factory relocation. The lift has double safety guarantee under load status, i.e. hydraulic support and mechanical lock; it is also designed with limit switch, so that it can stop in no time when the ultimate position is reached. In case of any unexpected power failure, the lift can be descended simply by turning the manual lower knob. In addition, the lift is also equipped with overload over-flow protection device. MAXIMA Heavy Duty Platform Lift is designed and manufactured in strict accordance with European Standard EN1493, technical parameters are as follows: Product specifications may change without notice. Ground requirement: compressive strength≥15MPa; gradient ≤1:200; levelness differences ≤10mm; make sure the equipment is away from combustible or explosive materials during both indoor and outdoor use.